Integrated disk backup appliances are now common, but Quantum and Veeam have taken the converged architecture to tape backups to eliminate the need for a dedicated external server. Quantum and Veeam today launched what they call a converged tape appliance, which integrates Veeam data protection software with Quantum backup. Until now, Veeam Backup and Replication users could only create tape backups by connecting a dedicated external server to host the Veeam software. The new Quantum backup appliance removed that layer of complexity by installing a blade server into its Scalar i3 tape library. The server is preconfigured to be Veeam-ready, with Windows Server 2016 -- Veeam's server OS of choice -- preinstalled. 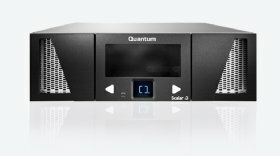 By installing a server to a tape device, Quantum has created the industry's first ever tape appliance with built-in compute power. "In some ways, this is a new category of product," said Eric Bassier, senior director of product management and marketing at Quantum, based in Colorado Springs, Colo. "In Veeam environments, every other tape vendor's tape requires a dedicated external server that runs the Veeam tape server software ... We took that server, we built it into the tape library so that we eliminate that physical server, and we make it that much simpler and faster to create tape for offline protection." Customers can buy a device with one IBM SAS LTO-8 tape drive for $17,000 or a two-drive version for $23,000. Tape storage has been around for a long time and "still remains one of the lowest-cost, long-term ways to store your data," said Ken Ringdahl, vice president of global alliance architecture at Veeam, based in Baar, Switzerland. But Bassier stressed the new Quantum backup appliance's true role in the modern backup and recovery system is it protects against ransomware. "It's offline. Data stored on tape is not connected to the network in any way. Because it's offline, it is the best and most effective protection against ransomware," Bassier said. The ransomware threat has brought on a renewed interest in tape for backup. Edwin Yuen, senior analyst at Enterprise Strategy Group in Milford, Mass., said ransomware has gotten more sophisticated over the past 12 to 18 months, and tape provides an offline backup method. "Ransomware is not an acute event," Yuen said. "You're getting infected, and it's sitting there, waiting. Oftentimes, it's mapping out or finding other backups or other restores." Storing data offline in a tape cartridge like the new Quantum backup option provides an air gap between live production systems and backed up data that is not possible to achieve with disk. That air gap can prevent ransomware from infecting live data. If you really think about tape, it's one of those technologies that got dismissed, but never actually went away. "If you really think about tape, it's one of those technologies that got dismissed, but never actually went away. It was consistently used; it just wasn't in vogue, so to speak. But there's certainly been a renewed interest in new uses for tape," Yuen said. "This integration by Quantum and Veeam really makes it a lot easier to bring tape into this configuration, so you can take advantage of that air gap." According to Yuen, thanks to market maturity and the age of magnetic tape technology, there are now only a few major companies that manufacture tape libraries. This is why Yuen said he finds the partnership between Quantum and Veeam especially noteworthy, as it demonstrates a relatively young company showing interest in tape. "The fact that these two companies came together shows interest across the board," Yuen said. "It's not a 20-year standard industry company, but one that's been an up-and-comer now getting into the tape market through this appliance."